Redprint App Builder is your app development flow on steroid! It’s your perfect Laravel CRUD Booster and App Builder. It has everything from it’s own Terminal Emulator, A Very powerful File Browser and Code Editor (!) and lovely and fast ways to build CRUD and Model to Model Relationships. It can literally save you hundreds of hours of coding and lets you concentrate on what matters most. The application logic and problem solution. Generate SOLID API with ease! Powerful in built Code Editor! Totally unobtrusive. 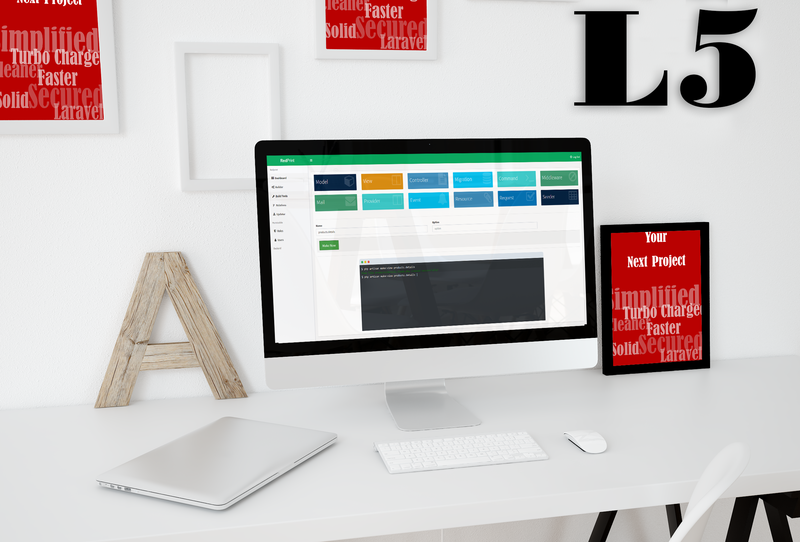 Version control and develop your app just like you do with vanilla Laravel installation! NO BLOATWARE whatsoever. Generate CRUD following latest Laravel standards. Built in Search and Pagination in CRUD. You can specify which fields are searchable. Image/File upload mechanism in built. Role/Permission (ACL) and User Management System (UMS) in built. Model to Model relationship building. Run all Laravel Commands from GUI. REDPRINT mode to ensure the system leaves no footprint on production application. For repetative tasks like creating a CRUD, you can totally rely on Redprint App Builder. It generates high quality Code to generate your everyday create, read, update, delete interfaces and backend. 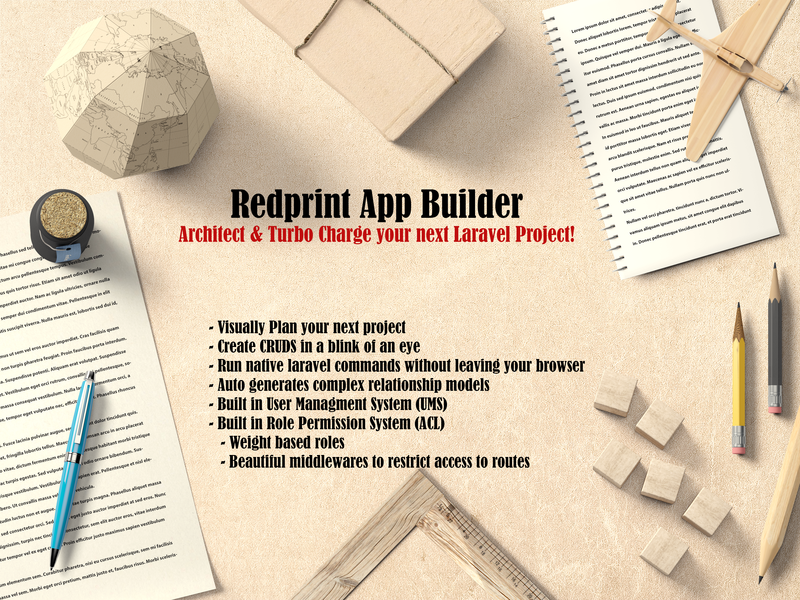 Redprint App Builder closely follows Laravel best practices. Which means, no garbage code. You’ll fall in love once you take a look at the code! We promise! The new version ( >1.5.6) can now generate API endpoints for external mobile apps to consume using JWT (JSON web token) ! Or your next SPA web app using Vue JS/React/Angular can consume the API generated by Redprint! Redprint has its own in built IDE! We know you still need to write your business logic on your own. What about having a complete IDE with syntax highlighting and auto completion enabled right inside the app? It can come extremely handy when you’re a digital nomad and need to change a piece of code without leaving the comfort of your browser. Redprint IDE comes with a file browser and quick file search too! You’ll LOVE it! With Redprint App Builder, you can tell the system to automatically generate your search system with the CRUD. Again, the code that gets genrated is of high quality and follows DRY. Have a look at the index method. With a few clicks, you can generate relations between two models. Not only that, it creates the dropdowns on a previously created CRUD that is related! For example, if you are creating a “Has Many” relationship between “Category” and “Products”, your products CRUD form will now “automagically” have a dropdown to select Categories! You can now run native Laravel commands from within Redprint! No need to remember all the commands, just go to build-tools, select the command you want to execute, write down the parameter and hit run! Not only that, Redprint already added a command that’s not even in Laravel yet! with `php artisan make:view your_view_name` Redprint will generate a view with basic layout for you! Redprint comes packed with its own Role Permission Package called “Permissible”. Permissible allows you to define user roles and permission with a weight based role system! Redprint has its own user management system that comes with Permissible. You can already create, update, delete users, set their permission/roles etc. Gives you a strong boilerplate to quickly start your next project! Redprint AB is committed to grow and become more powerful. Make your apps more robust and count on Redprint to help you along the way. Added more validations to the builder. More validations to prevent unexpected errors while creating CRUD. New commands (php artisan migrate, php artisan migrate:rollback, composer dump-autoload etc) on make tools page. Customize the form! Give them responsive and cleaner look. Upgraded to latest Laravel release. Set options for ENUM data types. Generated code has no code-smell! Sniffed and fixed for any indentation or code standard issues. Validations for defapret value on database fields. Toolbars on Dashboard file browser for distraction free coding. Small bug fixes in generator for special cases. - More stability fixes and refactoring for performance boost. - Fresh new theme and new customization abilities! - Fix bug with relation builder. - API Controller namespace fix. - New submit button animations.